Americans have long known that farmers markets offer shoppers food that’s unrivaled taste and freshness, however, a growing body of research points to the economic benefits of farm-direct marketing. One recent study discovered that, “for every dollar of sales, direct marketers are generating twice as much economic activity within the region, as compared to producers who are not involved in direct marketing.” The study goes on to reveal that for every $1 million in revenue, direct-market farms create almost 32 local jobs whereas larger wholesale growers create only 10.5. While direct-market farmers rely on you—their neighbors—to grow their businesses, they return the favor. The report’s author’s attribute the outside impact that these farmers exert on local economies to the fact that they source locally. Of the direct-marketing farmers surveyed, 89 percent buy their supplies (“inputs” in farm-speak) from local businesses. By contrast, larger wholesale farms purchased only 45 percent of their inputs from their neighbors. Because direct-marketing farmers are much more likely to patronize local feed stores, farm equipment dealers, and mills, the dollars that you spend at the farmers market stay in your community longer—they may even wind-up back in your pocket! The USDA estimates that local food sales from farmers markets, food hubs, CSAs, farm stands and farm to schools programs have grown from from about $5 billion in 2008 to $11.7 billion in 2014. Farms selling local food through direct-to-consumer marketing channels were more likely to remain in business over 2007-12 than all farms not using direct-to-consumer marketing channels, according to US Census of Agriculture data. According to the US Census of Agriculture, 144,530 farms sold $1.3 billion in fresh edible agricultural products directly to consumers in 2012. Farmers markets spur spending at neighboring businesses. A 2010 study of the Easton Farmers Market in Pennsylvania found that 70% of farmers market customers are also shopping at downtown businesses, spending up to an extra $26,000 each week. At the Crescent City Farmers Market in New Orleans, 32% of Market shoppers spend money at nearby businesses, resulting in $3.2 million in projected gross receipts and an annual contribution of $151,621 to local sales tax revenue. Boise, Idaho’s Capital City Public Market generated an estimated $4.5 million in economic activity for the local economy in 2011. So the next time you shop at your neighborhood farmers market, remember: not only are you appeasing your taste buds, but you’re giving your community a little economic boost. One dollar at a time. [i] Feenstra GW, Lewis CC, Hinrichs CC, Gillespie Jr GW & Hilchey D. (2003). Entrepreneurial Outcomes and Enterprise Size in US Retail Farmers Markets. American Journal of Alternative Agriculture 18, 46-55. http://journals.cambridge.org/action/displayAbstract?fromPage=online&aid=4430732. [ii] King RP, Hand MS, DiGiacomo G, Clancy K, Gomez MI, Hardesty SD, Lev L, McLaughlin EW. (2010). Comparing the Structure, Size, and Performance of Local and Mainstream Food Supply Chains. www.ers.usda.gov/publications/err-economic-research-report/err99.aspx#.UeWk-Caz7a4b. [iii] Hodges, A. W., Stevens, T. J., & Wysocki, A. F. (2014). Local and Regional Food Systems in Florida: Values and Economic Impacts. Journal of Agricultural and Applied Economics, 2(May), 285–298. Retrieved from purl.umn.edu/169063. [iv] Henneberry, S. R., Taylor, M. J., Whitacre, B. E., Agustini, H. N., Mutondo, J. E., & Roberts, W. (2008). The Economic Impacts of Direct Produce Marketing: A Case Study of Oklahoma’s Famers’ Markets. 2008 Annual Meeting, February 2-6, 2008, Dallas, Texas. Retrieved from purl.umn.edu/6785. [vi] Hughes, D. W., & Isengildina-Massa, O. (2015). 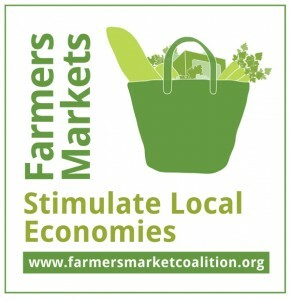 The economic impact of farmers’ markets and a state level locally grown campaign. Food Policy, 54, 78–84. doi.org/10.1016/j.foodpol.2015.05.001. [vii] Wyoming Business Council. (September 2014). Wyo Farmers Markets Make Big Economic Impact. Retrieved from www.wyomingbusiness.org/news/article/wyo-farmers-markets-make-big-economic-/8675. [ix] Williams, Christina. “Portland Farmers Market Finds Shoppers Motivated by Local Economy Over Fresh Tomatoes” (2012) www.bizjournals.com/portland/blog/sbo/2012/11/portland-farmers-market-finds-shoppers.html.